First published in 1918, My Ántonia is a story of the American Midwest, of the pioneers and European immigrants who settled in the prairies in the late 19th century. The novel is narrated by Jim Burden, a New York-based lawyer who has documented his memories of Ántonia Shimerda, a Bohemian girl whose family moved to Nebraska when Jim was a young boy. More than any other person Jim could remember from his childhood, Ántonia seemed to represent the prairies, both the tough conditions of the land and the essence of the people who lived there. In other words, she embodied the resilience of the pioneers’ spirit. The novel itself is divided into five books, each one dealing with a different period in Jim’s life. As the story opens, the recently orphaned Jim is travelling by train from Virginia to Nebraska to begin a new phase of his life with his grandparents. He is ten years old. Also travelling to Nebraska are Mr and Mrs Shimerda and their four children having just arrived in America from their homeland of Bohemia. During the journey, Jim befriends fourteen-year-old Ántonia (the Shimerdas’ second child) and is intrigued to discover that the Shimerda family are moving to a neighbouring property, the one closest to his grandparents’ farm. Before long the two youngsters are firm friends, spending time together whenever possible. As Ántonia is bright and eager to learn, Jim teaches her to speak English while they explore the countryside, noting the way it changes from one month to the next. Nebraska is a land of blistering summers and biting winters, and the first year takes its toll on the Shimerda family, Ántonia’s father in particular. A quiet and dignified man by nature, Mr Shimerda has no experience of farming or manual work (back in Bohemia he was a musician). As a consequence, he is desperately lonely and homesick for his homeland. Moreover, the Shimerdas’ new home is terribly run down – it is frequently described as a ‘cave’ or ‘hole’ – and in spite of some help from their neighbours, the new arrivals struggle to get by. After paying over the odds for their land, they have little money to spare for food. If the Shimerdas can make it through to the spring, then they can plant a garden and buy some chickens, maybe even a cow. After a truly devastating winter for the family, the responsibility falls on Ántonia and her older brother Ambrosch to work the land as they attempt to make a go of their new life in Nebraska. While Jim looks forward to the prospect of an education at school, Ántonia must work the fields; she is as strong as any young man. A couple of years later, Jim and his grandparents move to the local town of Black Hawk where Jim can attend school. On her arrival in town, Jim’s grandmother persuades her neighbours, the Harlings, to employ young Ántonia as a housekeeper. Once again, the two youngsters are living next door to one another and able to spend time together in the evenings. This section of the novel is bright and optimistic; for the most part, Ántonia is a conscientious worker, and she fits in well with the Harling family, playing with the young children and keeping them amused as far as possible. One of the most interesting aspects of this section of the narrative is Cather’s focus on ‘the hired girls’, the Bohemian and Scandinavian teenagers who were sent to the town to work in some form of service. Jim reflects on the curious social system at play, whereby at first these country girls had to find jobs to help their families to pay off their debts or to make it possible for their younger siblings to attend school. In many ways, their experiences – both on the prairies and in service – made these girls more rounded than their younger brothers and sisters. In time, this decision to send their daughters out to work in service helped the foreign farmers to become prosperous more quickly than several of their native-born peers. Many American farmers were just as hard-pressed for money as their immigrant neighbours but were too proud to allow their daughters to go into service. If the girls couldn’t get positions teaching at one of the local schools, they simply sat at home in poverty instead. In the next book, we follow Jim as he continues his education in Lincoln where he meets up with Lena Lingard, one of the Scandinavian hired girls who was friendly with Ántonia back in the town. Having trained as a dressmaker in Black Hawk, Lena now runs a successful business of her own in Lincoln. Once again, Cather touches on the developments within society at the time as Lena is a portrayed as young, independent, self-made woman with no desire or need for a husband to support her. It’s one of several contrasts in the novel: the experiences of the immigrant settlers vs those of the native-born farmers; life in the country compared to life in the town; opportunities for the educated vs those for the uneducated; a family’s expectations of their daughters vs those of their sons. There are many more. By the time we reach the final section of the book, a good thirty years have passed since Jim first met Ántonia, and he returns to Nebraska to see her again. Life has been hard on Ántonia, and yet the qualities that shine through are her optimism and determination, her unquenchable spirit and ability to survive. I’ll finish with a quote that captures a glimpse of this. She was a battered woman now, not a lovely girl; but she still had that something which fires the imagination, could still stop one’s breath for a moment by a look or gesture that somehow revealed the meaning in common things. She had only to stand in the orchard, to put her hand on a little crab tree and look up at the apples, to make you feel the goodness of planting and tending and harvesting at last. All the strong things of her heart came out in her body, that had been so tireless in serving generous emotions. For other perspectives on this book, here are links to reviews by Emma and Ali. 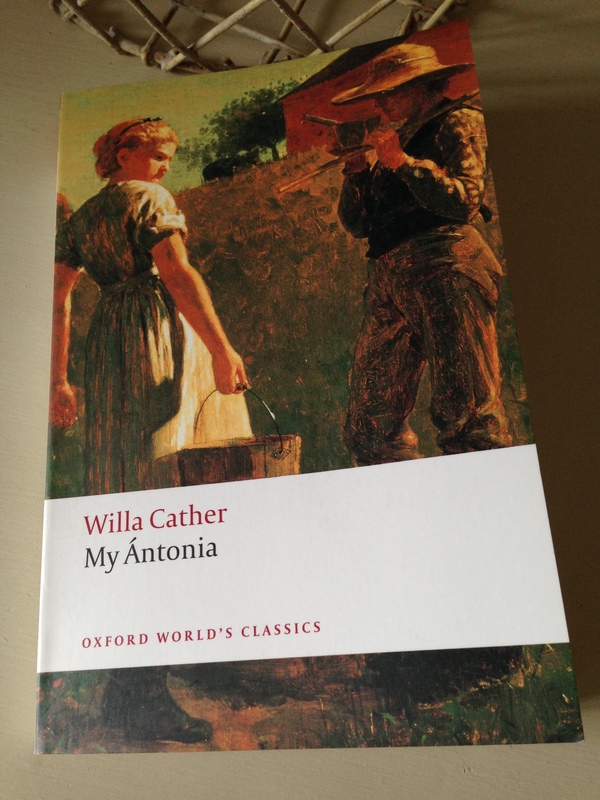 This entry was posted in Book Reviews, Cather Willa and tagged #ReadWomen, Book Review, Classics Club, Fiction, Oxford World's Classics, US, Willa Cather on June 28, 2016 by JacquiWine.